"I love what I do and hope that it comes through in my work so you too can 'feel the love' . (insert disco lights here) I have a degree in product design from Parsons in NYC and it's there that I learned to dig the dirt. To see what other kinds of nonsense I've been up to, visit my website." Lumenair is a complete life support system for plants, providing light, water, and a tree inspired structure on which they grow and thrive. 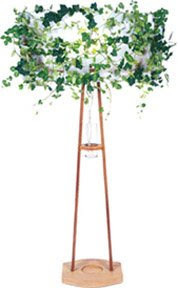 Lumenair was designed to deliver the effect of sun through a forest canopy while taking advantage of plants’ amazing ability to remove toxins and dust from the air and generate oxygen, promoting a higher level of indoor air quality.